I don't really see advantage in that, thought of getting another set of manifold and fiddle them around a bit but it's a lot of work to relocate 2 turbos and for what? It's not perfect but I can work with the stock manifolds to build a decent 2->1 downpipe, as well as the V band hi/low press side piping which has some nice 90° bends to fab up something pointing to forward to the air intake and IC. The "advantage" is that it clears the mount. Haha yeah I figured, but compared to whipping out the welder, grinder, some hammers, drills and a acy torch for making a new pair of mounts it would be too much work for me for this setup. I'd rather go all out then and build a single turbo manifold. But I kinda decided to stick with these little ones in the first place and make it all running, as I mentioned before I'm not out to push it to the limits (yet). Last edited by Funkee; 11-06-2017 at 05:57 AM.. Swapped the oil pans last night. 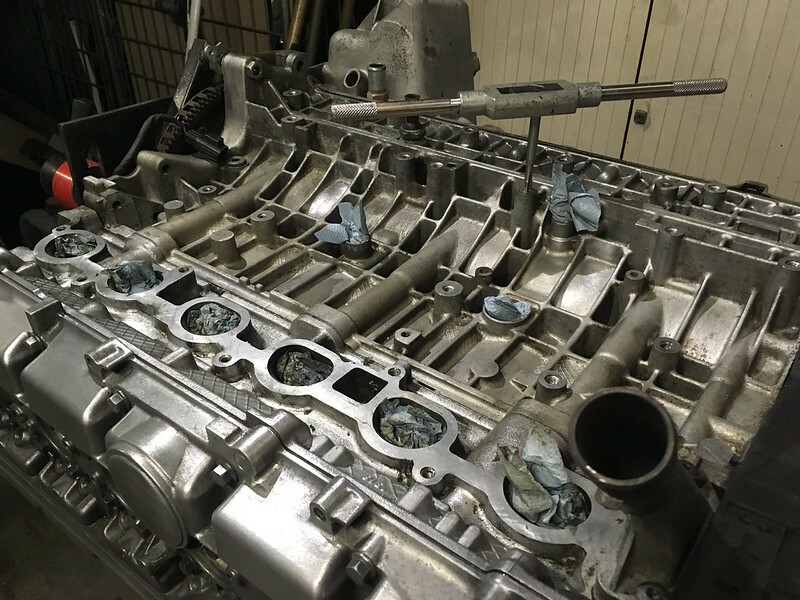 Love the fact that it's just plug 'n play, all the bolt holes are there already for the longer oil pickup and 4 extra bolts in the middle of the sump which the S80 pan didn't have. First I'm going to clean the pan real well and put some new seals before putting it all together permanently again. I have the idea to put the engine back as far as possible, (maybe weld a wheel barrow in the firewall) so I might have to trim the ridges on the front of the sump off to clear the sway bar. I believe they're only there as a guide for the positive wire from the battery to the starter on the 960. Nothing spectacular but since the oil pan was still covered in mud and/or cow dung (really, it smelled like that) I cleaned it a little tonight. I got some bio degreaser from my father in law which works extremely good (no brand agricultural wholesale), with just a dish brush and some hot water the honey-like residu comes right off. The outside is a very rough cast so still some dirt is trapped in all the little pinholes. Maybe after I assembled everything I have the complete engine CO2 blasted; no particles like regular blasting media intruding parts you don't want to and no damaging of surfaces. Love to see where this is going. lol @ babyfoon... proberen niet de compressor aan te laten slaan. Oh crap I didn't even know there were T6 240s around already over here Nice projects, I can definately get some ideas out of those. The 242 is sleeping since 2years. 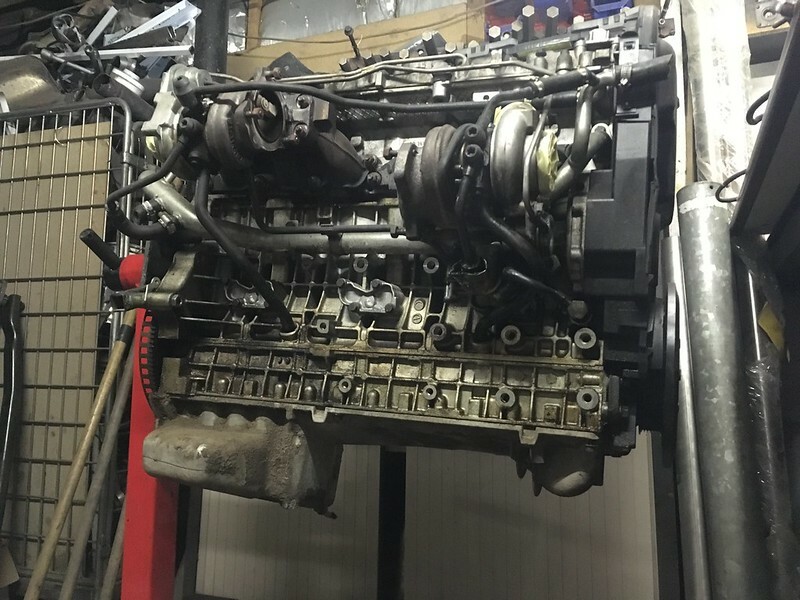 It just got a b230f swap when i stored it. Plan is to take it out of storage this februari to use it as daily. Probably gets a lpg injection kit from Poland. The 740 was daily this year, had the head freshend up and mounted a 16T. Only plans on that car is swapping a locker and 302 brakes on it i have laying around for some time now. Sounds good What LPi kit? 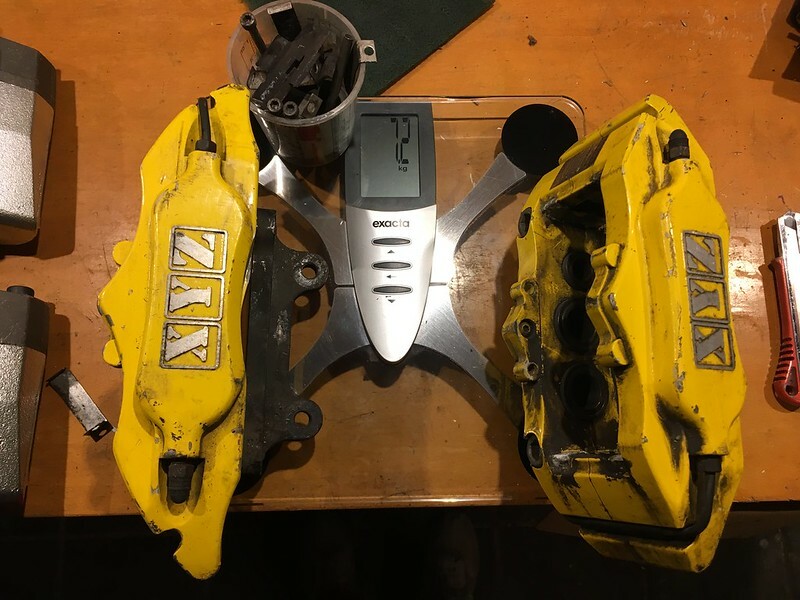 (cross post) Got some XC90 calipers for cheap. Not sure if I'll use them cause they're really heavy indeed. 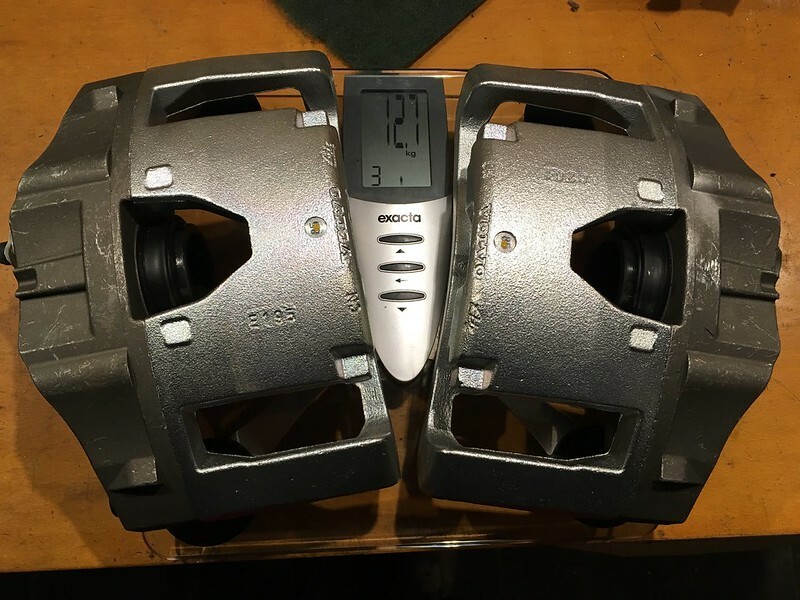 The set is almost 13kg without the carrier, which will add about 2 kg each I'd expect. This vs 7.2kg for the aluminium XYZ ones (some mounting hardware and pistons I took out in the cup). With adapters the unsprung weight quite add up. 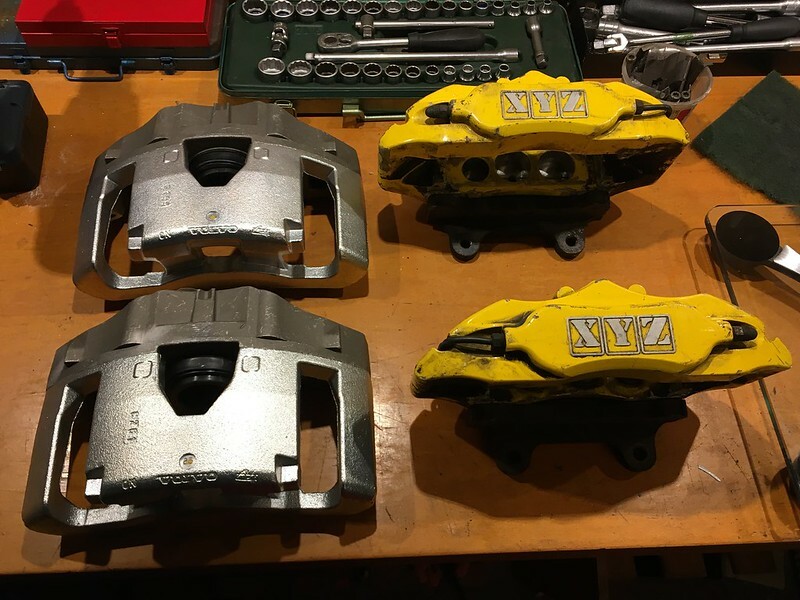 The XC90 calipers are really huge as you can see, the XYZ are over 30 cm/12" in lenght but they kind of get dwarfed next to them. I'll see whether I'll use them or not, Mattis pointed me to BMW E38 4 pot calipers which would could be found pretty easy around here with good rebuild packages available as well. 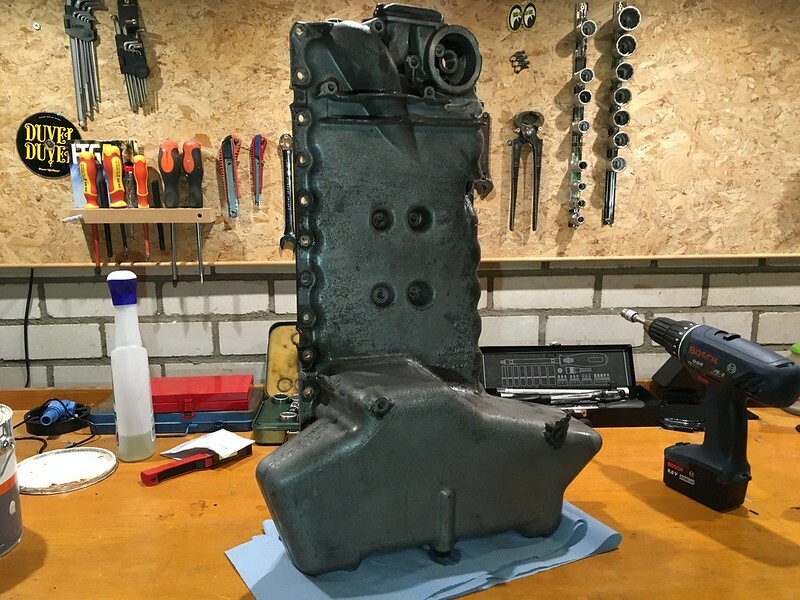 This side of the engine was covered in greasy gunk, cleaned that up and drilled and tapped the holes for the 960 mounts. Still I want it a lot cleaner than this, maybe I'll have it C02 pellet blasted before it stays in the car definately. The pass side engine mount doesn't clear the to be downpipe, so for now they'll only be used as a reference when fitting the engine. forward for more updates as time goes by. Thanks. First I will make it run stock like it is right now, want to make sure to have the CVVT working properly. 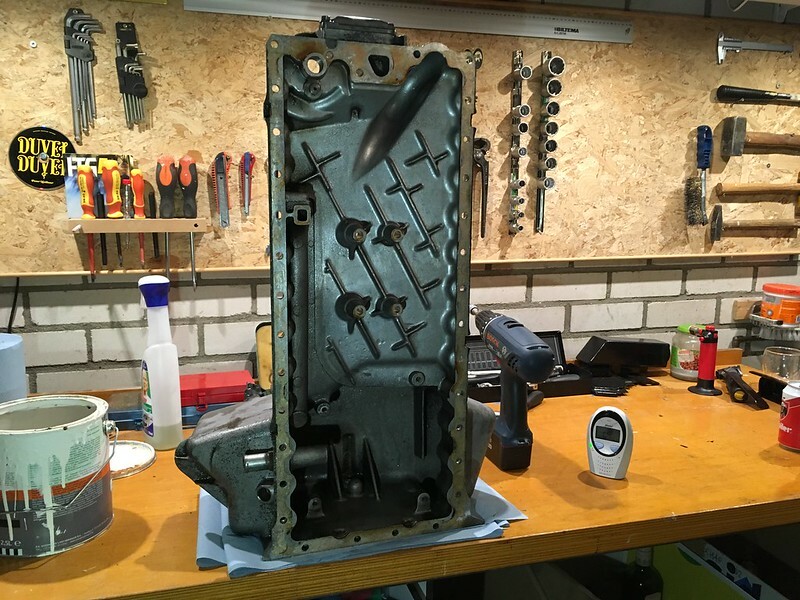 It seems that ECUmaster EMU Black/Classic can take care of the CVVT, so that will probably be the ECU of choice. Will add some boost to make around 300~330 on the wheels, maybe up till 400 at the crank to keep it safe with stock internals. Thanks. Where in Belgium are you? 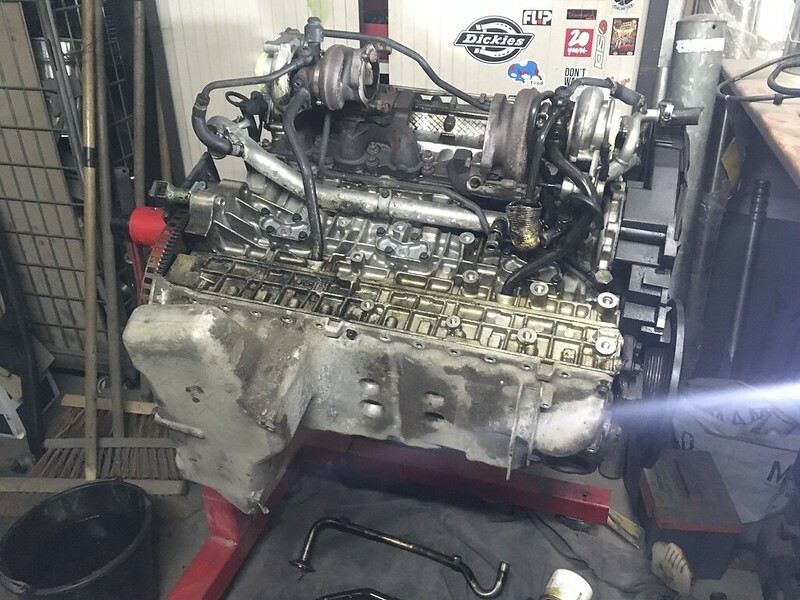 Love the project, I did the same swap into a Bertone' except I bought the engine from Capt Bondo (he was a regular on here back in the day) and it came with custom made RWD mounts. He ditched the tiny twins and went HX35 just like you were considering. If you are looking for a "quick" car I'd stay twins as it takes a bit to get the Holset up to speed. I have actually complained to some friends about how laggy the Holset is and currently it's off the car and will be getting an upgraded impeller before going back on. I also stretched the rear fenders a bit to fit 265/35R18s, I know I have a few pics of the process that I can dig out if need be, but it's fairly straight forward. We took a cut across the trunk floor and up and over the wheel arch. I think we took it the cut around to about the two o'clock position maybe even a little further (thinking of the right wheel well) and that may have been over kill but worked for us. We then put a port-a-power (not sure what you call it over there, it's a small hydraulic ram that has the jack connected by a hose) We placed the jack at about the 12 o'clock position and started to push against the fender lip and the body. We used the mounting tab as a data point and kept jacking until a 27mm socket slipped in there (~1.5" gap) and then used some perforated Aluminum and sheet metal screws to hold the gap open until we could weld in some steel. I wasn't able to weld the whole thing shut so some if was sealed up with fiberglass and then the whole thing was shot with undercoating and it's hard to tell it's not factory. My favorite trick was how I got the gas door to stay shut properly...I tried tweaking the door to get it fit the body but there was still a gap at the top, so I grabbed a super magnet from my tool box and stuck it in the top left corner....TA-DA! Good luck on your build and hope this helped a little! I'm hit or miss on here, if you like shoot me PM with your email and I will be happy to answer any questions that I can. Thank you! 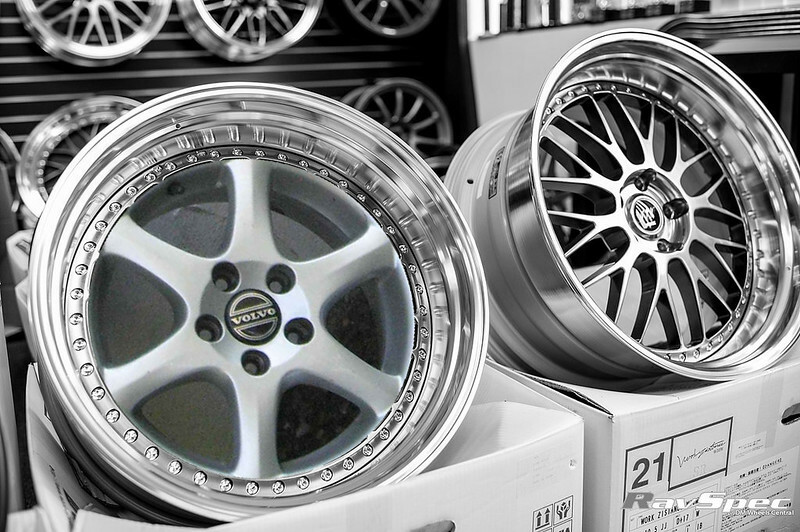 Yes, a modified HX35 or modded tinies (turbo tuner I know says he can mod them to be good for up to 550 horse) would be the next stage if I wanted more. I'm curious to seeing pics of the widened body though! 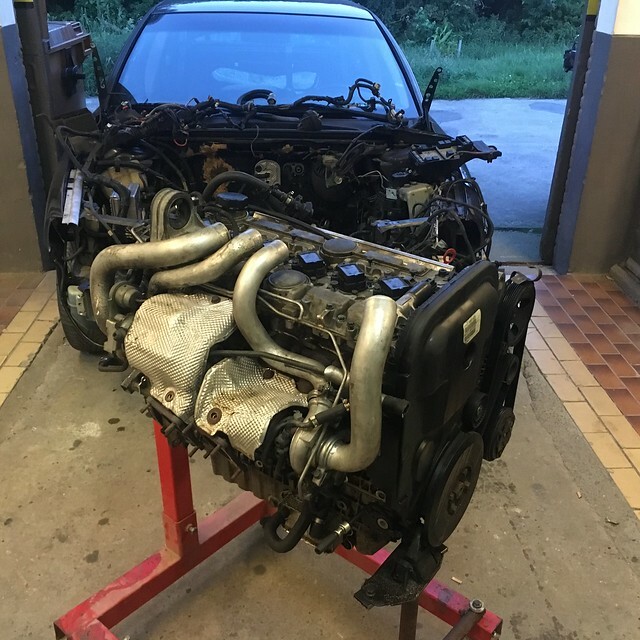 Last edited by Funkee; 12-06-2017 at 06:34 PM..
My brother is doing a similar swap in his 83 242 so this will be interesting to see them side by side. So posting images is giving me fits and I need to get back to work, here is a link to imgur that shows the finished product. I know I have a few pics of the process but I didn't upload them to botophucket it seems...let me charge my old phones and see if I can find them. I do remember specifically saying "wish i had taken more pics, after I shot it with undercoating you can barely tell anything happened..."
Cool. What are his goals and what ECU is he going to use?